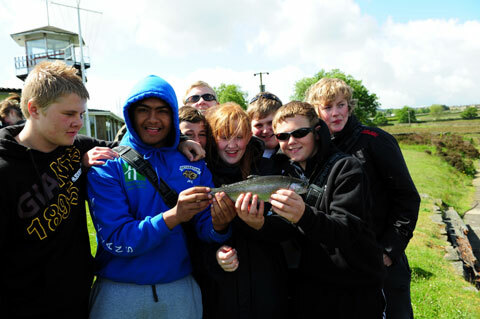 The Countryside Alliance Foundation’s Fishing for Schools programme, in association with the Calder and Colne Rivers Trust, held a successful course on the 23rd and 24th of May with Honley High School and introduced pupils to the sport of fly fishing. The course, which was held over 2 days at the school and at the Huddersfield Sailing Club, with the fishing facility provided by Huddersfield Angling Association, involved 12 children from the school and introduced them to outdoor education. Fishing for Schools is an innovative and inspiring programme which is simple and effective: with the aim of getting fly fishing onto the National Curriculum, short courses are run for children aged between 14 and 16 who wish to learn a practical life skill. Whilst academic work occasionally proves difficult for some children, this alternative learning, melding with existing ASDAN* modules embraces both classroom and outdoor learning whilst contributing to the Certificate of Personal Effectiveness, which is a GCSE alternative for many children. The course works by supplying the children with fishing equipment and, led by a dedicated team led by celebrated angler Charles Jardine, taught how to assemble it, cast and catch fish in a safe environment. Subjects such as safety, insect life, knot-tying, fish biology and respect for local wildlife are all covered. Charles Jardine commented: “I love running this course and these students got so much out of it. I had a warm welcome at Honley High School and thoroughly enjoyed my time here. Watching self esteem, confidence and delight blossom in these youngsters through angling has been a real delight. Fly fishing acts as a gateway to the natural world, and the benefits of getting kids out of the classroom and into the great outdoors are numerous. These youngsters have had an experience they will never forget. The fishing tackle was provided by the Environment Agency under their “Introduction to Angling Initiative” and they also part financed the training of the instructors.